Another Innovative Solution by NJM Group. Wood, Styrofoam and other materials currently used to create block-outs all have a common flaw, they must be pulled out after the slab is in place. Pocket isolators constructed from HDPE are also environmentally sustainable. The grid framework on the external of the pocket isolator™ allows for increased reinforcement as the concrete will mould into each section. What is pocket Isolator by NJM Group? 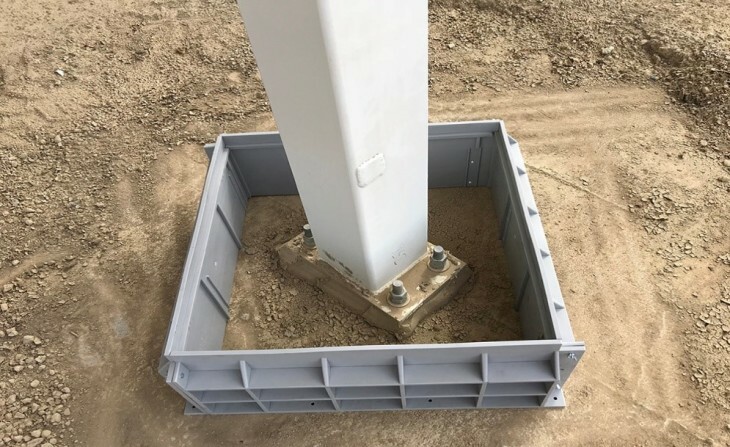 Pocket Isolator™ or form guards by NJM Group are a “leave-in-the-slab” solution to protecting columns, pillars and poles – prior to pouring concrete – from exposure to moisture migration and its harmful effects on the anchor bolts, grout bed, base plate and lower segments of the vertical structure. The NJM Group pocket isolator is a square, four-piece construction that creates a barrier between the inner and outer concrete pours to protect the base of a column, pillar or pole. It has the ability to accommodate different coloumn and pole diameters, but the standard size is 770mm(l) x 290mm(h) x 65mm(w). They are corrosion-resistant and long-lasting. The form guards provide a “leave-in-the-slab” solution. They don’t bond to concrete, therefore do not have to be removed. They can be penetrated with conventional hand tools to accept conduit or PVC doglegs. We are a local business located in Heidelberg, Victoria. With local manufacturing facilities and a friendly team on stand-by we are equipped to service your pocket isolator™ requests. Who uses our pocket isolators? Pocket Isolator by NJM Group is a trusted product used by businesses all over Australia. Costco is one of our recent clients. Their new buildings in Sydney, Epping and Moorrabin are built with our pocket isolators. Pocket Isolator by NJM Group has recently been applied at the construction site of a new Costco unit in Epping, with a total of 93 columns requiring form guards. Designed to streamline concrete construction, a pocket isolator is a unique and innovative product. Due to its effectiveness, it is ideal for large scale projects and significantly simplified the construction process at the Costco site. A pocket isolator uses 100% Virgin High Density Polyethylene (HDPE) that doesn’t bond to concrete and therefor doesn’t have to be removed. It instead becomes a part of the building structure. A HDPE pocket isolator is less labour-intensive to use than other form-guards.Other materials such as wood and Styrofoam have to be pulled out after the slab is in place, resulting in cave-ins and wasted concrete. Routing and cabling is easy as well because it is possible to use conventional hand tools. Previously, with the use of wooden forms, wiring cables and electrical conduit was a difficult task. It is also much safer to incorporate cables into the HDPE form guards as there is no need for saws which will produce harmful dust and fumes. Pocket Isolator is a product engineered by NJM Group to facilitate brands all across Australia. It’s a modern, innovative solution that helps big businesses like Costco grow by giving them the opportunity to build new franchises effectively and economically. Manufacturing time of 10-12 weeks applies on Pocket Isolators from the date of order.